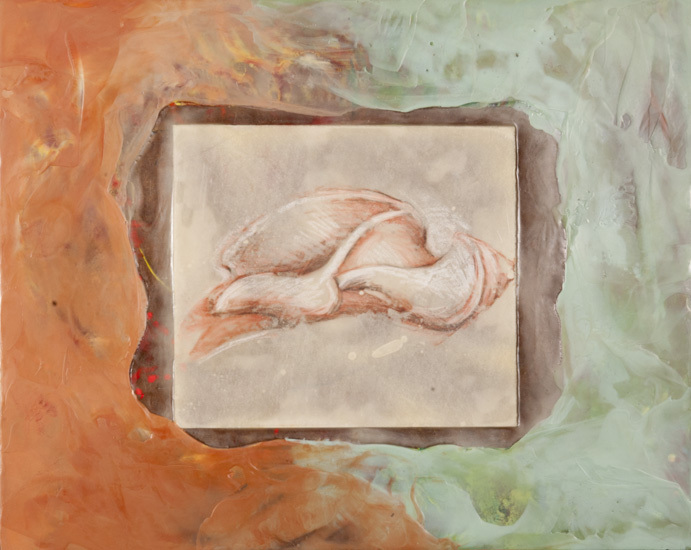 Alix Hitchcock is showing encaustic wax paintings on wood panels, plus three monotype prints made from encaustic wax surfaces. The general theme of all the work is Ocean and Sea Life. She will give a free talk and demonstrate how she creates the encaustic wax pieces at the gallery on Saturday, June 11 at 2:00 pm. Hitchcock received her Masters in Art in painting from New York University in 1983, and her Bachelor of Fine Arts in printmaking and painting from the University of N.C. at Greensboro in 1973. She was an Instructor in Drawing at Wake Forest University from 1989 to December, 2012, when she retired. She has also taught drawing at Salem College, the UNC School of the Arts, The Sawtooth Center for Visual Arts, the NC Center for the Advancement of Teaching, Mitchell Community College, East Carolina University, The Reynolds Homestead, Reynolda House Museum of American Art, and the Weatherspoon Museum of Art. Alix Hitchcock was the Winston-Salem Artist of the Year in 1998, and is a founding board member of Artworks Gallery.